2. Trim off beet tops, leaving 1 inch of stem and roots to prevent bleeding of color. Wash thoroughly. Sort for size. Cover similar sizes together with boiling water and cook until tender (about 25 to 30 minutes). Caution: Drain and discard liquid. 3. Cool beets. Trim off roots and stems and slip off skins. Slice into ¼-inch slices. Peel, wash and thinly slice onions. 4. Combine vinegar, salt, Splenda®, and fresh water in large Dutch oven. Tie cinnamon sticks and cloves in cheesecloth bag and add to vinegar mixture. Bring to a boil. Add beets and onions. Simmer 5 minutes. Remove spice bag. 5. With a slotted spoon, fill hot beets and onion slices into clean, hot pint jars, leaving ½-inch headspace. Cover with boiling hot vinegar solution, leaving ½-inch headspace. Remove air bubbles and adjust headspace if needed. Wipe rims of jars with a dampened clean paper towel; apply two-piece metal canning lids. 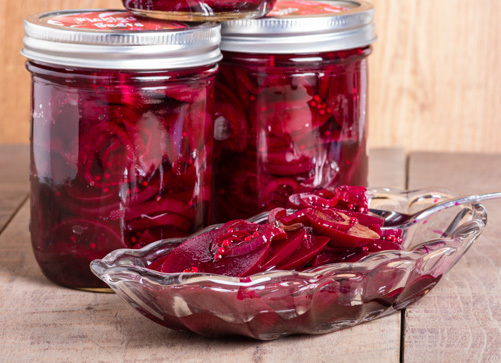 Variation: Pickled whole baby beets - Follow the directions above but use beets that are no more than 1- to 1½ inches in diameter. Pack whole after cooking, trimming and peeling; do not slice.